Director Ryan Coogler reunites with Michael B. Jordan, the star of his excellent debut Fruitvale Station, for the seventh Rocky film in a franchise that has seen many high and low points in its near forty-year run. While it doesn’t quite manage to reach the heights of the original Rocky, Creed does come closer to any other film in the series to capturing the winning spirit of its predecessor while also blazing a new trail of its own. In lesser hands, this reboot could have come off as cynical and obligatory but Coogler has a genuine, back-to-basics sensibility that proves to be the perfect fit for this boxing saga. Jordan stars as Adonis “Donnie” Creed, the son of former heavyweight champion Apollo Creed, who feels unfulfilled with his undemanding desk job and decides that he wants to follow in his father’s footsteps by becoming a professional boxer. Against the advice of friends and family, he moves to Philadelphia in hopes of training with the great Rocky Balboa (Sylvester Stallone) to become a formidable fighter in his own right. With Balboa and a new love interest Bianca (Tessa Thompson) in his corner, Creed works his way up to the heavyweight championship with a determination to restore his family’s fighting legacy. Though Stallone gives a very touching performance as an aging Balboa, it’s clear from the start that this is Jordan’s movie. He not only brings a tremendous ferocity and physicality to the role but he also captures the emotional turmoil of a young man with both unresolved family issues in his past and an uncertain life path in his future. When Donnie spars with himself in the mirror or with a television projection of his father during a previous fight with Rocky, his personal demons come to the forefront and we gain a deeper understanding of his character without the movie needing to explain away his motivations. 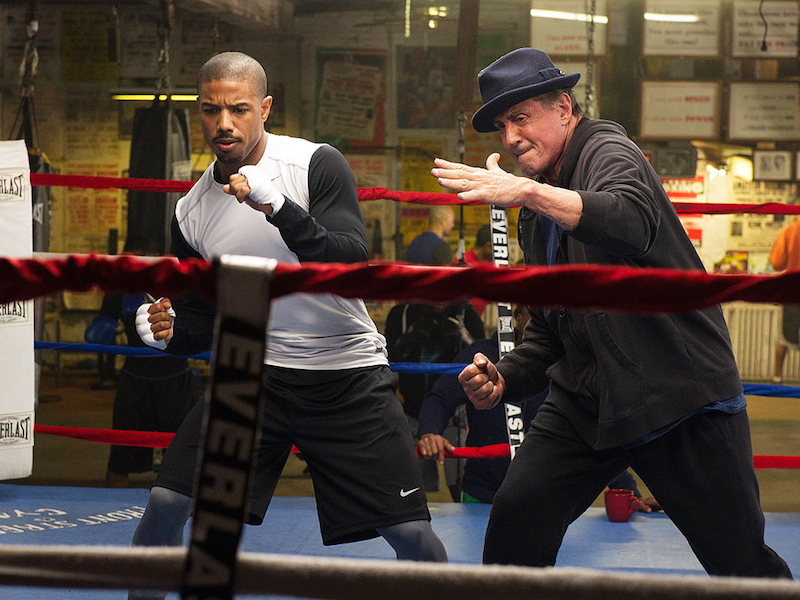 Besides the noteworthy casting of Jordan in the title role, the most notable distinction between Creed and its predecessors lies in the look and the feel of the fighting scenes. From an audacious one-take opening scene in a Tijuana boxing club to the climactic final battle, it’s not a stretch to say that this is the best looking entry in the franchise. The nimble camerawork brilliantly mirrors the movements of the fighters and gets us close enough to the action to catch bits of dialogue and body language that would likely otherwise get lost in wide shots of the ring. Despite all of these unique touches and improvements, what’s frustrating is how little this film chooses to experiment with the basic plot structure of the previous Rocky entries. There’s an almost slavish dedication to the training montages, love story arcs and musical cues of the previous films that make this more closely resemble a remake rather than a reboot or a sequel. Still, there’s plenty of new elements in Creed to inspire a whole new generation of crowds to cheer on a champion.